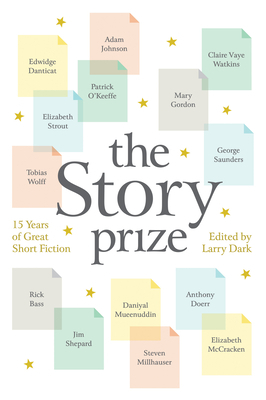 This anthology of short stories marks the fifteenth anniversary of The Story Prize and includes one story from each of the annual winning collections, beginning with Edwidge Danticat's The Dew Breaker and concluding with Elizabeth Strout's Anything Is Possible. The founder of The Story Prize, Julie Lindsey, and its director, Larry Dark, created this award to address the lack of one specifically for collections of stories. Together they choose three finalists from the previous year's publications, which are sent to three judges--an author, a bookseller or librarian, and a critic or editor--who, independently of one another, relay their choices. The prize is then presented at an annual celebration in New York, where the finalists read from their books and then discuss their work with Dark. Excerpts from these interviews--or, in a few cases, the judges' citations--introduce each story in the book. The authors chose the stories included to read at the annual Story Prize event. LARRY DARK has been the director of The Story Prize since its inception in 2004. Before that, he served as series editor for six volumes of The O. Henry Prize Stories (1997-2002) and compiled, edited, and introduced four other anthologies: Literary Outtakes, The Literary Ghost, The Literary Lover, and The Literary Traveler.